Facebook reveals a new AI-powered feature. Tesla sues the former employee allegedly behind its recent sabotage. And it turns out memes aren’t the only cornerstone of the modern internet threatened by the European Union’s proposed Copyright Directive. First up, on Google Trends: Facebook is delighting lovers of dad jokes everywhere by revealing a new eye-opening feature – literally. An artificial intelligence-powered tool currently being tested by Facebook researchers is capable of opening closed eyes in photos. It does this by first scanning pictures in which the subject’s eyes are open, then mapping a version of those eyes to a photo where the subject’s eyes are closed. 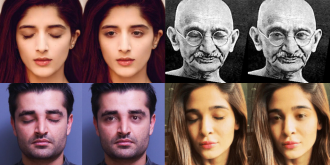 The researchers included several sample photos in their report, from a black-and-white portrait of Mohandas Gandhi to a modern teenage selfie, and the results are very convincing. No word on when or if Facebook will actually add the feature to its site, however. Next, from LinkedIn: The alleged Tesla saboteur mentioned in yesterday’s show has been identified and sued. Specifically, Tesla is suing former process engineer Martin Tripp for allegedly writing software that hacked the electric car company’s manufacturing operating system and transferred several gigabytes of data to outside entities, including dozens of confidential photographs and a video of Tesla’s manufacturing systems. According to the suit, Tripp has admitted to writing the software, which he allegedly developed in retaliation for being reassigned instead of promoted because he was allegedly a terrible coworker. Finally, on Reddit: It turns out memes are not the only potential casualty of the European Union’s proposed Copyright Directive: It also threatens links. The Directive’s Article 11 would introduce a “link tax” requiring internet companies to get permission from publishers to cite their work. For example, ITWC content like Hashtag Trending that quotes another publisher’s article would have to get permission or possibly pay to use said quotes. Fine, so we’re a niche website. Now try imagining Wikipedia, Facebook, or Twitter without those articles or the quotes accompanying them. On Wednesday, the Directive was approved by a European Union committee, which brings it one step closer to becoming law.